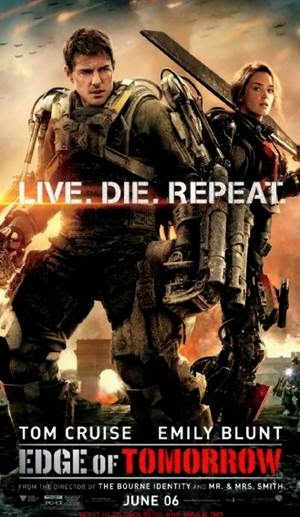 Edge of Tomorrow stars Tom Cruise, Emily Blunt, and Bill Paxton and others in an alien invasion movie that almost entirely focuses on the human journey within the event of a global invasion. And it does it very well. The movie starts out with news clips of a meteor streaking across the sky, much like the Russian meteorite some years ago. From there, we see news reports of the rise of the aliens as they slowly take over. Cage (Cruise's character) shows up heralding a new battlesuit that turns the tide against against the aliens. But then he finds himself thrust onto the front lines and via various deeds, he suddenly finds himself looping through time, reliving the last few days over and over. In one of his loops, he meets Rita (Blunt). She seems to know what's happening to him and says that the next time he wakes up, to find her. And from there, his journey begins, in the quest to defeat the aliens. Like Groundhog Day, we're presented with the same day over and over as Cruise tries to sort out what to do and learn. It reminded me of video games like the old Dragon Quest where all you have to do is play it over and over, learning all the right moves to beat each level. The story is done well. It's subtle and funny. Somber and hopeful. And even has a few hints of other human aspects of emotion. But one of the more interesting parts of the film include Cage's development throughout, as he tried again and again to get things right, he slowly becomes more seasoned as the film progresses. Cruise conveyed that well. At first I didn't like the tech he wears (in the movie trailers), but it grew on me in the film. And the aliens reminded me of the Sentinels from the Matrix movies... but much worse. And despite this being an alien invasion movie, they didn't take over the screen. Christopher McQuairrie (Usual Suspects, Jack Reacher) developed the screenplay, and Doug Liman (the Bourne film franchise) directed. It makes perfect sense the movie was this fun. Overall, I truly enjoyed getting sucked along in this film, where one thing led to another and sometimes expectations of where it was going was blown out of the water. So it kept me on my toes. Cruise was Cruise at the top of his game. Blunt was fun and believable and various other characters did not leave you wanting. As a popcorn flick goes, I had no problem dropping the bucks to see the movie and think it merits a popcorn 9 score. I don't think you can go wrong, no matter how you catch this movie.